My daughter is coming home this weekend to help with the Christmas decorating. She is very busy with the end of the semester at school, but she really didn't want to miss trimming the tree. So it will be whirlwind decorating here this weekend. Then she will go back to school and for the next few days, our Little Red House will be filled with boxes and tissue paper and decorations spread across every horizontal surface. It always looks really terrible before it looks really good. After totally ignoring this Christmas cactus for the last few months -- it was as dry as a desert -- it has suddenly begun to bloom right on schedule. With absolutely no help on my part. Don't tell anyone, but these candy canes are left over from last year. I tend to crave chocolate candy, so they are safe from me. And they are so tightly wrapped, that I couldn't be bothered to try to eat them. Maybe that is the secret to dieting will power -- all manufacturers should make it almost impossible to actually get at their products. Thank you so much for continuing to participate in Mosaic Monday, even though I know you must all be very busy with the coming holidays. I really appreciate all your wonderful images and comments! The linky thingy will be up by 8:30 pm Eastern time, Sunday. See you then! Beautiful photos of your beautiful Christmas details! What a special time planned with you daughter. Enjoy! The moments pass too quickly. My Christmas cactus has bloomed as well. It seems the more I neglect it the better it does. Too funny, Mary. 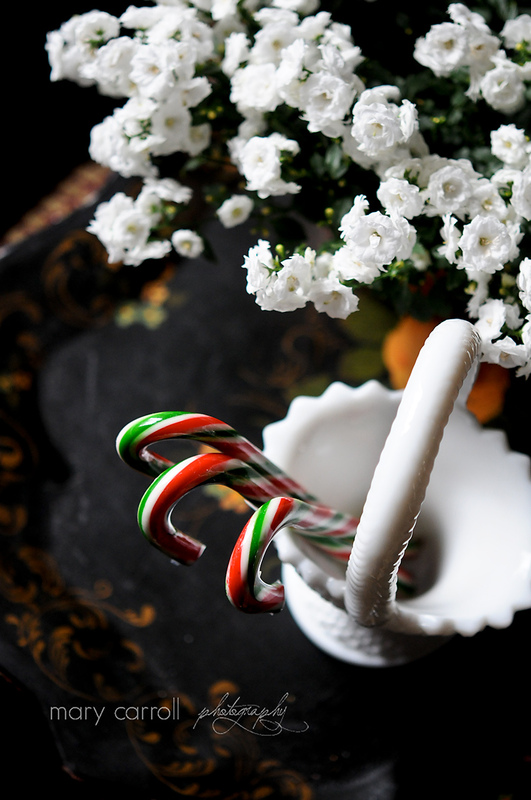 I am using my left over candy canes in my milk glass too! Actually, it makes me all puffed up that I have done something that you have done. I don't get over here much, but you KNOW I am a fan! Always have been and always will be. I just want to tell you again how much I enjoy your photography! It is always so breathtaking. I like the angle on your last one, Mary. I'm thinking that is why my cactus suddenly bloomed after 4 years...I stuck it outside and totally ignored it. Love your photos! 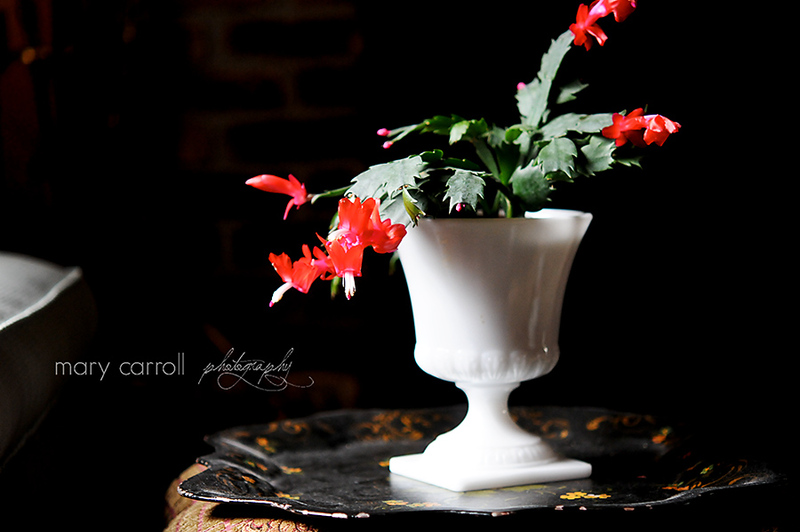 I love the light reflected off the red Christmas ornament next to the wonderful milk glass! Hope you are having a nice weekend decorating and thanks for hosting MM again! As usual your photographs are stunning. I know you and your daughter will have lots of fun decorating! Have a wonderful time with daughter. No one cares that things are all messy and bad looking right now...when it all comes together and everything is beautiful, it's all worth it. Ha...I thought I was the only one who recycled candy canes. I don't care for the either, so they last years!! Such beautiful shots. 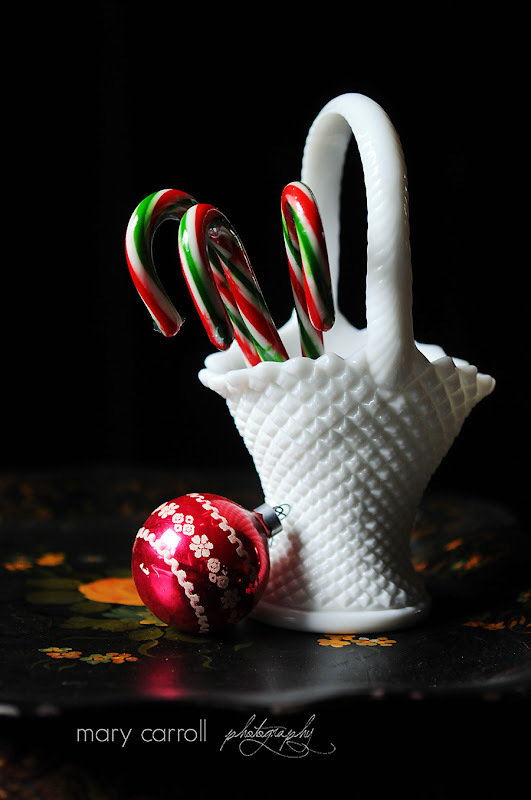 The milk glass against the candy canes is stunning.